Your enterprise must market on several targeted government contracting fronts to be successful. Simply registering as a federal government contractor or acquiring a small business set aside designation does not mean that contracting officers will find you or that larger corporations will seek you out as a teaming partner. A GSA schedule or a multi-year IDIQ umbrella contract, purchase agreement or similar vehicle may look promising, but they are really no more than hunting licenses. The game must still be bagged (targeted sales of specific products or service projects to customers). Government agencies, like companies, have long range plans and budget cycles. Keep abreast with the latest developments in trade magazines and journals regarding government contracting trends within agencies to develop and market solutions for anticipated requirements. Monitor agency web sites and forecasts. Be constantly aware of the annual federal budgeting cycle, its development progress in the executive branch and its approval status in Congress. Agencies push to commit excess funding late in the fiscal year and at the same time forecast their next year needs for submittal to higher authorities. In the 1 October to September 30 fiscal year cycle, July, August and September are prime marketing periods. Watch FEDBIZOPPS for sources sought notifications, requests for industry comments on draft RFP's and similar early indications of programs taking shape which will later be advertised in full solicitation. Go after them early enough to market and get them set aside for your small business designation and influence the development of the project with constructive input creating a presence in the eyes of the customer and prospective teaming partners. Other than FAR Part 12 Commercial Contracting for off-the-shelf items, entry into federal government contracting for small business usually occurs through service contracting direct to an agency or teaming as a subcontractor with another firm for a major program. Even for commercial products, particularly new ones on the market, the best way to introduce your solution to a customer is to become involved in a service contact supporting the client's operations. With regard to larger government contracting corporations to whom you could subcontract, cover the waterfront. Find out what they are bidding and aggressively market a piece of the action as a small business. Find the locations for the largest government contractors nearest you and register at their supplier business sites. Everything they buy for their facilities, their personnel and their operations counts toward the small business goals required contractually of them by their enormous government contracts. Research their web sites and locate their small business liaison officers. Make appointments and visit them. While visiting, seek the names and titles of managers internal to their companies who manage prime contracts involving expertise your business can supply. Go after those managers. 2. Establishing a good working relationship with the GSA Contracting Officer on the schedule solicitation and getting his/her assistance in working the system expediently. 3. Presenting viable, auditable cost history on what you have previously sold your products for to pass the cost/pricing audit portion of the process. Most companies continue to bid work to the government through FAR Part 12, Commercial Contracting procedures or other contract vehicles discussed this web site while their GSA schedule application is pending. Please examine this site for articles on teaming, marketing, IDIQ contracts, negotiations, subcontracting and many others. Remember there are thousands of companies out there going through the system, so you will have to be patient. Very few applicants get through it in any less than 6 months. A GSA Schedule is a very valuable item to achieve, but it takes time to do so and there are other forms of government contracting you can use while your application is in process. A capability statement (CAPE) is an absolute necessity. It contains the specific information a contracting officer needs to place an order. This information includes such items as your D&B Number, your government registration numbers, your North American Industrial Classification System (NAICS) codes and the like. These items are selected or provided by you or determined by the system when you register your company for government contracting. Writing a winning proposal is an art form. It takes practice and the more proposals you prepare and submit the more artful you will be. 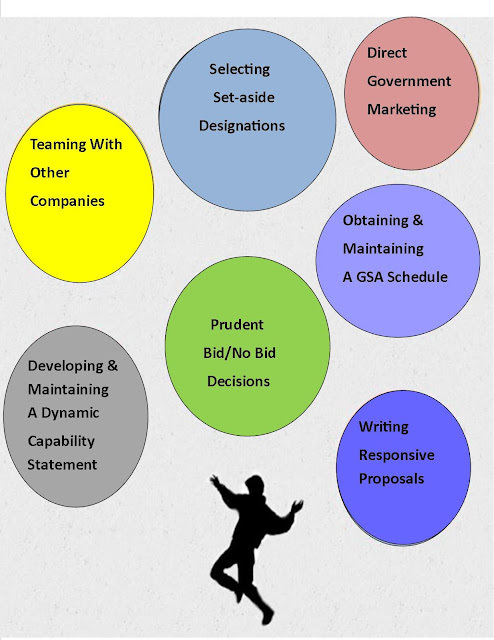 You will find yourself utilizing the same materials over again on successive proposals. Management approaches, personnel profiles, win strategies and other major components of a good submission will fill your library and extend your CAPE to specific solutions for specific customers. Your reputation as a reputable performer in the small business federal government contracting community is important. Be selective and high performing. Agencies, past performance data bases and other companies will be observing you, recording your performance and passing the word along to others directly and indirectly. Then insure your web site, your capability statement and your marketing plans are maintained current alive and dynamically reflective of your successes as you pursue new business and carefully develop your library of past performance records by project with accessible profiles to use in your government proposals. Small to Feds is maintained by Ken Larson a Veteran of 2 tours - US Army Vietnam. As a Volunteer Counselor, he assists many small businesses with their planning and operations processes. 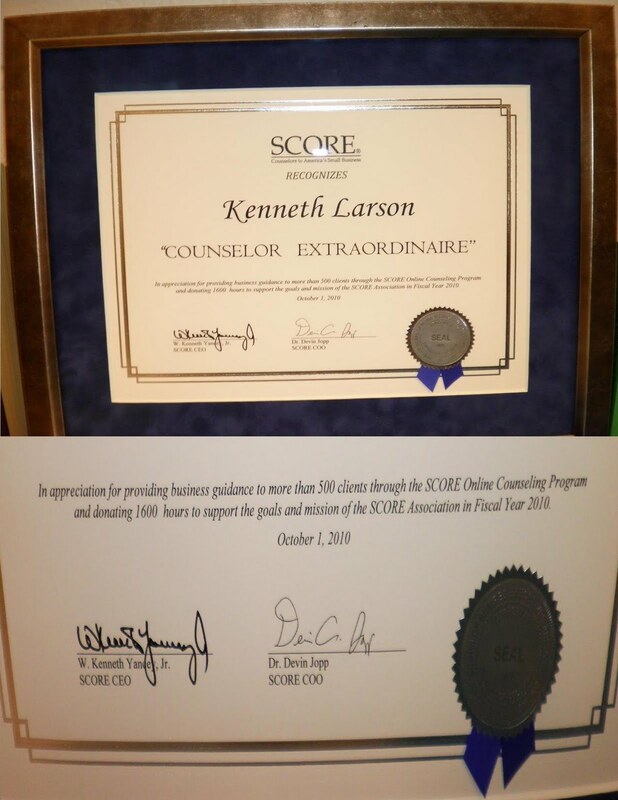 Subsequent to his military service Ken spent over 30 years in federal government contract management and 10 years in small business consulting. He gets many inquiries from small companies wishing to enter or enhance their position in federal government contracting or grow their commercial enterprise. This site is intended to assist in answering those questions and others small businesses have in developing and operating a successful firm.